Miami Herald (July 2017): Chad Johnson’s 12-year-old daughter is a budding track star. And she might be faster than her Dad. Pop Sugar (June 2017): Thinking of running your first half-marathon? Why not do it at the happiest place on earth? After all, it might just make your half . . . the happiest race on earth. RunDisney offers an excellent selection of race events for all levels at Disneyland parks throughout the year, with themes galore that speak to even the most fringe of Disney fans. Star Wars? Avengers? Tinker Bell? RunDisney’s got you covered. Runners’ World (Feb. 2017): After My Son’s Knee Healed, We Ran to Celebrate. A “Star Wars”-themed 10K was the perfect comeback race. Yahoo! Sports (Jan. 2017): Paraplegic man inspires at Disney marathon. Competitor (Nov. 2016): As it turns out, Olympic medalist Jenny Simpson isn’t just an elite runner, but she’s also quite a master planner. And at the Disney Wine & Dine Half Marathon on Sunday, the Simpsons saw their own family fairytale become reality—husband Jason won the 13.1-mile race in record fashion; Jenny took second place among the women; and the entire family made the special weekend their family vacation. Indeed, there was a lot for the Simpson clan to celebrate during the race that started at ESPN Wide World of Sports Complex at Walt Disney World Resort and finished at Epcot. Jason Simpson shattered the race record, posting a time of 1:10:24—more than a minute quicker than the previous mark of 1:11:47. NY Times (Nov. 2017): Women really do run the world. For nearly a decade, more women runners have been crossing the finish line than men. In the United States, women make up 57 percent of finishers — that’s about 10.7 million women racing. Globally, female race participation is up 25 percent, compared to 7 percent for men. That’s a lot of girl power, which is why we’ve created this women-only guide to running. Here you’ll find advice about the big and small challenges of running while female, and how women can get faster and stronger in spite of them. So ladies, grab the sports bra, lace up your sneakers and let’s hit the road. Yahoo! Sports (Nov. 2016): Why the Cubs’ championship – and his Disney moment – meant so much to Javier Baez. Runners’ World (Aug. 2016): Disney Princess Half Marathon – Why Run It: This iconic series invites gal pals of all ages and athletic abilities to a weekend of Princess-themed racing inside Walt Disney World Resort with nine different events, including a half-10K-5K combo (dubbed the “Glass Slipper Challenge”) and five kids’ races for runners/crawlers up to 13 years old. 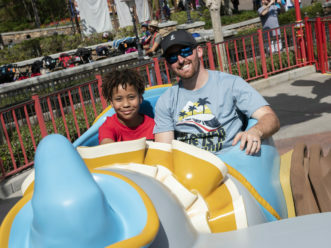 The half journeys through both the Magic Kingdom and Epcot, passing park highlights such as Cinderella Castle, Spaceship Earth, and World Showcase. 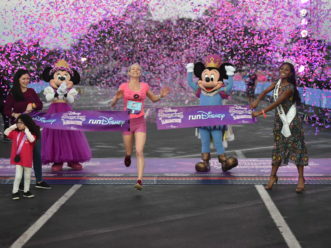 Fully-costumed Disney princesses cheer runners, and the three- day expo—open to all participants—includes celebrity runner appearances and training and nutrition panels from industry experts. Orlando Sentinel (June 2016): Bobby Valentine is back at a baseball field near you this week. He is coaching the X Fury at the Disney International Salute to Baseball tournament at the ESPN Wide World of Sports Complex. The Connecticut-based team finished pool play undefeated, including a 4-0 shutout of FTB Celebration on Thursday. Forbes (Jan. 2016): Marathons are big business. The New York City marathon alone has revenue of $73 million and generated economic impact of $415 million in 2014, including $22 million in sales and occupancy tax, according to a study by research firm AECOM. So it’s no surprise that a global tourism powerhouse like Disney is in on the action. Miami Herald (Nov. 2015): Early one Saturday morning, as my wife and 12-year-old son slept, I sneaked out of our home in Tampa and drove about an hour to Walt Disney World. That’s right. I went to the Mother of All Theme Parks without my family. To be fair, my visit involved neither my son’s beloved Space Mountain roller coaster nor my wife’s cherished Haunted Mansion. I was after a different kind of the kingdom’s magic: largemouth bass. Guided fishing excursions on four of the sprawling Central Florida park’s natural and man-made lakes have been offered for nearly two decades, although relatively few folks know about it. Yahoo! Travel (Jan. 2015) The Star Wars Half-Marathon Weekend at Disneyland isn’t just about a race, it’s the Venn diagram intersection of Star Wars enthusiasts and serious runners. You might think that would be a tiny sliver of the population. You would be very wrong. 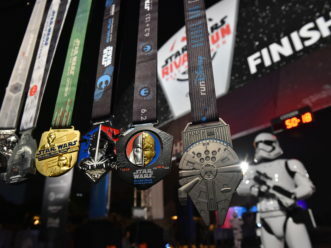 Thousands gathered for this past weekend’s journey to a galaxy far, far away that included the Star Wars Half Marathon, Star Wars 10K and Star Wars 5K, and the runDisney Kid Races. 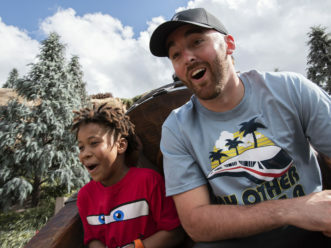 Orange County Register (Jan. 2015) Princess Leia, the Jedi and even Darth Vader and his Imperial Stormtroopers joined forces Sunday when a popular sci-fi franchise about a galaxy far, far away took over the Disneyland Resort. More than 12,200 runners participated in Disney’s first Star Wars Half Marathon. 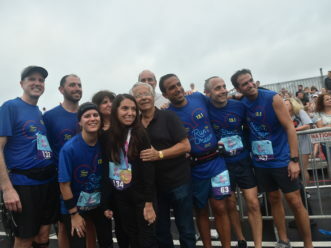 They were among the 23,000 people to come together in the inaugural Star Wars-themed running weekend, which included a kids race, a 5K and a 10K over four days. Globo (Jan. 2015) Corinthians striker [Paolo Guerrero] was awarded [the MVP Mickey trophy] thanks to the votes of experts from German clubs, Peter Stoger of 1.FC Koln, and Roger Schmidt of Bayer Leverkusen. 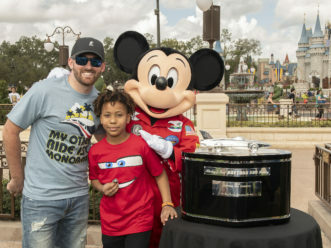 The Mickey trophy was the result of a partnership with Disney, which promoted and hosted part of the Florida tournament. 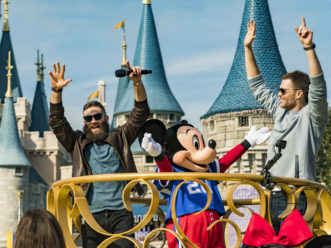 Corinthians, Fluminense and German players attended an event at Magic Kingdom Park. 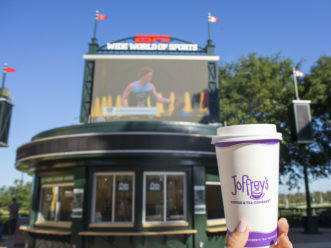 Journeys Magazine (Aug. 2014) The Happiest Place on Earth just got a whole lot sportier with a full range of Disney-themed races, including a marathon, half marathon, and a very “Goofy” 5K family fun run. Tour the theme parks and pose for plenty of photo ops along the way. The Walt Disney World Marathon is the final race of the weekend where you can complete the most magical 26.2 miles on Earth and run through all four Walt Disney World Theme Parks, starting at Epcot, continuing on to the Magic Kingdom Park, Disney’s Animal Kingdom Park and Disney’s Hollywood Studios before an exhilarating finish back at Epcot. Shape Feb. 2014) Only at Disney can you find princesses and fairies, villains and monsters, animals and aliens, and everyday men, women, and kids running side by side. And with more than 163,000 participating in 26 runDisney races every year, the series has developed a bit of a cult following. Here are the top reasons runners are so mad about a mouse. GQ (Oct. 2013) Last year, when the boys were still Pee Wees, they crushed everybody, every game, everywhere, earning the regional championship and the coveted trip to Disney, where, every December, elite teams from across the country come to the ESPN Wide World of Sports Complex and compete in the Pop Warner Super Bowl. Orlando Sentinel (June 2012) Even among the hordes of British travelers who annually descend on Walt Disney World, these three U.K. athletes stand out: the former captains of the national soccer teams in Wales and Northern Ireland, and the starting goalkeeper from England’s 2006 World Cup squad. Fox Sports Florida (May 2012) You can pick him out from across the vast infield by simply looking for the beige straw hat – an iconic image in the elite world of track and field that flourishes here in the distant corner of a far different world, Disney.